The Nicholls State football team has been one of the hottest teams over the last couple of years in the Southland Conference under Tim Rebowe. A major reason for the Colonels’ success has been their ability to sign underrated talent in the state of Louisiana. The Colonels did it once again in this year’s signing class signing dynamic players such as De La Salle QB Julien Gums, and St. Charles Catholic QB Lloyd Nash along with signing one of the best offensive linemen in the state in Houma’s own Chad Cheramie Jr. from South Lafourche High School. 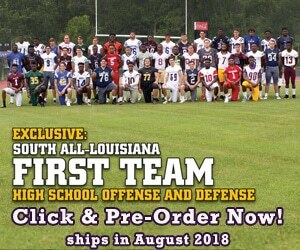 Cheramie is a four year starter for the Tarpons and has accomplished a lot over that period of time being named 1st team All-District two times, 1st team all region two times, All State Honorable Mention, LHSCA 1st team All-State, and three time linemen of the year for South Lafourche High School. 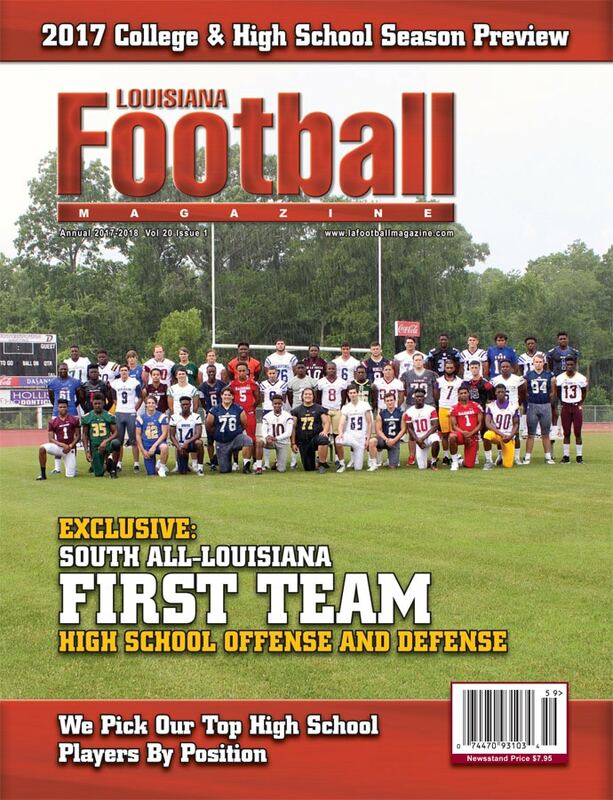 In addition to that, Cheramie was also on the cover of our South Louisiana football magazine cover and even made an appearance on our T.V. show earlier this year. 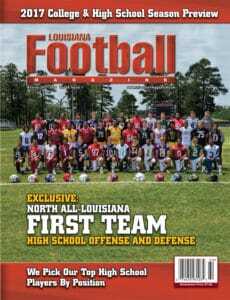 Louisiana Football Magazine’s recruit expert Lee Brecheen believes that Cheramie has what it takes to be a great college player. 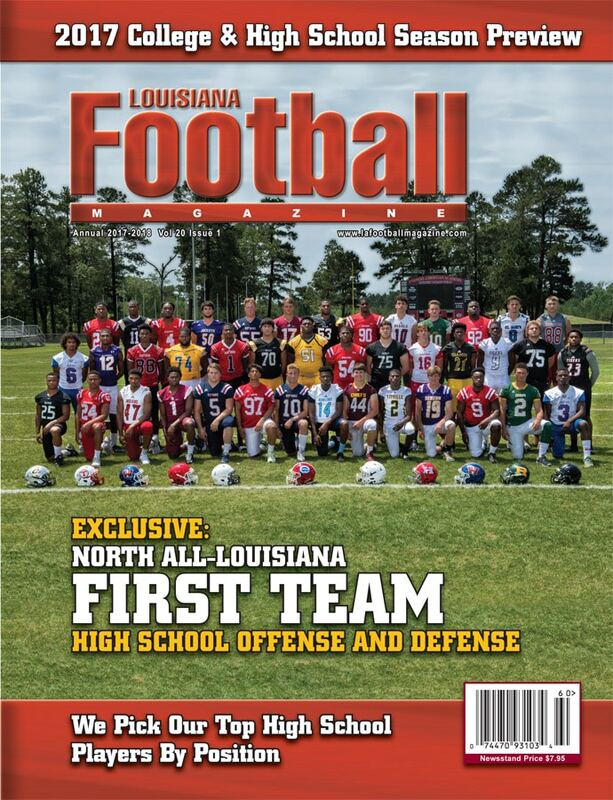 Cheramie has been very grateful to Brecheen along with the rest of the Louisiana Football Magazine staff for getting his name out there when it comes to not only the magazine but the TV show as well. For anybody that does think differently about Cheramie’s play, just do not confront him on the football field as he is not only big at 6-4, 290, but he is athletic and strong. Athleticism and size is a deadly combination for a big offensive lineman, but what is most important is how he finishes his blocks on every play. For Cheramie, there are two major reasons on why he is one of the best blockers in the state the last couple of seasons. Cheramie can do it all as he has had plenty of pancake blocks over his career whether it is pass or run blocking. His strengths have attracted some Southland Conference schools including McNeese State and Southeastern Louisiana University, but it was the senior Tarpon’s hometown college that made the most sense in the end. In speaking of getting SLHS back on the map, Cheramie believes that his soon to be alma matter will have plenty of success in the future after the team finished with a 6-5 record losing in the first round of the Class 4A playoffs to Tioga with a first year head coach in Blake Forsythe. The All-State offensive lineman was a three time lineman of the year for the football team and he knows what it takes in order to not only have individual success but team success. For Cheramie, he is looking forward to continuing his career at Nicholls State University, but it is something about the Friday night lights that he will always reflect on. Cheramie’s prep football career may be over, but that does not mean that he will abandon the Tarpon football program anytime soon. Cheramie never really modeled his game on anyone until he found about a late great Tiger offensive lineman who was on his way of having a promising NFL career before a freak accident ended his life. Like the late, great Andolsek, Cheramie is a tough football player who will gain leverage and pancake the opposing defensive lineman. Even though Cheramie is as tough as it comes, he is still a humble young man that is grateful for everything that has been thrown at him. Cheramie knows exactly what he wants to do when his playing days are over as he wants to give the game that has given him so much joy and share it to others. For Nicholls State fans, they are not getting a great football player, but they are getting essentially one of their own. “Nicholls State fans should be excited about me because I will bring a “down the bayou” tempo and aggressiveness to their Colonels and also a lot of great fans to tailgate with,” Cheramie said. When talking to a player like Cheramie, who is a great player from South Lafourche High School, is down from the bayou, wants to coach, and enjoys the game of football, the more it is like talking to another Ed Orgeron (LSU Head Coach). 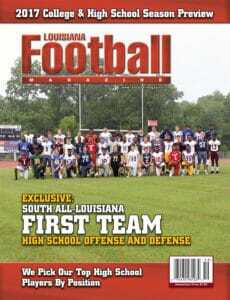 Like Orgeron, Cheramie is a South Lafourche product that the community should be really proud of. Previous: LAFM TV 12th Season! Episode 19!